Most of what Trump said publicly on his overseas trip came as music to Israeli ears after eight years of the Obama presidency. President Trump's visit to Israel was notable for what was and wasn't said, for the broader international canvas that served as the background for the trip, the intrusion of the Manchester terrorist attack, how the parties responded to the attack, and for some priceless visual elements that cut through the diplomatic speak and had a humanizing effect. To be sure, his twenty-eight-hour trip to Israel was ambitious given his packed itinerary. It included a visit to the Western Wall in Jerusalem's Old City along with the Church of the Holy Sepulchre; a meeting and remarks with Israeli president Reuven Rivlin at his residence; a meeting and remarks with Prime Minister Netanyahu at the King David Hotel; a first-family dinner at Netanyahu's home; a meeting and remarks with Palestinian Authority president Mahmoud Abbas in Bethlehem; a wreath laying ceremony at the national Holocaust museum, Yad Vashem; and his main address for the visit at the Israel Museum. 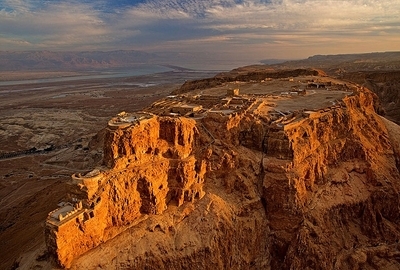 Trump was originally set to deliver his final remarks at the ancient fortress of Masada near the Dead Sea, which would have been a breathtaking backdrop, especially if held at sunrise, but he changed the venue when he learned his team would not be able to land his helicopter at the top of the site. True story. To be fair, the image of the president and his entourage ascending by slow-moving cable car would be best to avoid, along with the image of White House staff on an hour-long schlep up the snake path. Otherwise, it can take a while to reach the summit—just ask the Roman Empire. It took them several months to construct a siege ramp adequate to the task. Coming off the presidential visit to Saudi Arabia, even the flight to Israel took on added meaning, as there have never been direct flights between the two nations. The White House initially made a point of noting this first-ever flight but it turned out that George W. Bush beat him to the punch on May 16, 2008. Of course, beating both presidents, there was Muhammad's Night Journey, mentioned in the Koran (al-Isra), where instead of Air Force One, he flew al-Buraq from "the holiest Mosque" in Mecca to "the farthest mosque," which in Islam is traditionally presumed to be Jerusalem. Like Southwest Airlines, the bags flew for free but he may have been charged extra for the ascension to heaven (al-Miraj). Either way, joining the company of the Prophet Muhammad and George W. Bush puts Donald J. Trump in a pretty exclusive club. In scoring Trump's visit to the Holy Land, most analysis can't help but compare the previous eight-years of the U.S.-Israeli relationship under Barack Obama. With that starting point, the visit felt like the first sip of water after a long trek through the Negev Desert for most Israelis. That is despite any noticeable concrete achievement from the visit other than the visible restoration of warm relations. Netanyahu was positively giddy with the fact that he finally had a friend and a Republican in the White House after not only surviving President Obama's two terms but three years of Bill Clinton's presidency from 1996–99. With almost a wave into the rearview mirror at Obama, Netanyahu said, "For the first time in many years—and, Mr. President, for the first time in my lifetime—I see a real hope for change." Perhaps Donald Trump had lent him his book, "The Art of Hyperbole" after outlasting and usurping Obama's "hope and change" theme. On a practical level, little is known about what the two leaders discussed behind closed doors. Publicly, however, there was no mention of Trump's campaign promise to move the U.S. embassy from Tel Aviv to Jerusalem. Nor was there any mention of an agreement on Israeli settlement construction, such as a return to the Bush-Sharon understanding of 2004. Trump continued to praise the Saudi king in Israel, but it was hard to tell if that was merely afterglow from all the pomp and circumstance of the visit or if he had any Saudi commitments or inducements to deliver regarding the peace process. If he did, it was not mentioned in public. In fact, Trump never even mentioned "two states" as the goal of the peace process while speaking next to Netanyahu and later Abbas. This last fact alone is intriguing and serves as a reminder of Netanyahu's February visit to the White House. On a policy level, Trump's one-state, two-state, two-step dance is even more clever than his sword-dancing skills displayed hours earlier in Saudi Arabia. Is he really setting aside the two-state solution? Somebody ought to let someone know because there are literally hundreds if not thousands of people—including most of official Washington—who have been pushing that heavy boulder uphill for years. That's like telling the Romans at Masada that after months of building a siege ramp, they should have taken the elevator instead. What can be read politically from the almost Dr. Seuss-like "One-State, Two-State, Red-State, Blue-State" approach? Is there a strategy there or is it just about leaving the details up to the Israelis and Palestinians and if he likes it in the end, he'll slap his name on the peace agreement like it was a hotel? 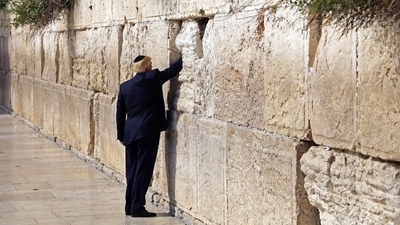 From an Israeli and Jewish standpoint, Trump's visit to the Western Wall, or Kotel, was extremely significant as it marked the first time a sitting U.S. president made that journey. In so doing, he symbolically recognized the deep Jewish connection to Jerusalem. Despite the mocking Twitter meme that the note he left in the Wall was a folded map of his Electoral College victory, he does appear to feel Israel and support the Jewish state at kishka, or gut level. Having studiously avoided over-posting on Twitter during the first two legs of his trip abroad, he did change the banner picture on his personal Twitter account to one of him with his hand on the Wall, with his eyes closed in prayer or reflection. There was also touching video captured of Ivanka tearing up after spending a few moments there as well. Far less sentimentality can be attributed to the folks at the U.S. State Department. If none of their personnel joined the president at the Western Wall, then it was likely because they have no earthly idea where it's located. Earlier in the week, Secretary of State Rex Tillerson said that from Saudi Arabia, they were traveling to "Tel Aviv, home to Judaism," which would no doubt come as a surprise to Jews the world over who for centuries have closed their Passover meal by saying, "Next year in Jerusalem." Even the most secular Hanukkah-only Jews would probably be aware the holiday commemorates the restoration of the Jewish Temple in Jerusalem by the Maccabees or Hasmoneans. Nevertheless, the long-running celebrations of buffoonery that is American diplomats tripping over themselves when describing Jerusalem's location isn't unique to this president. The rapid and public vacillations on the topic were. 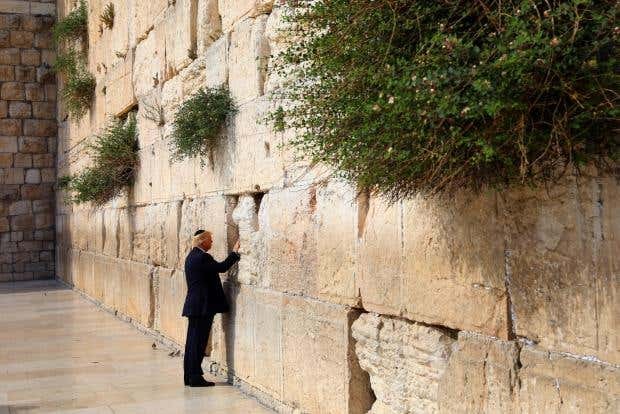 In the run up to the presidential trip, Mr. Trump indicated that he'd like to visit the Western Wall. The U.S. diplomats apparently told the Israeli officials that Trump's visit to the holy site would be private and that Netanyahu wasn't welcome to join as Israel does not have legal jurisdiction over the area, which was, according to them, located in the West Bank. Convinced that this was not White House policy, Israeli officials asked for an American clarification on the matter. The White House did not respond publicly, but on Monday Secretary Tillerson conceded that the Western Wall was in Jerusalem but he would not say that it is in Israel. Meanwhile, America's ambassador to the UN, Nikki Haley, said, "I believe the Western Wall is part of Israel." Not to be outdone, taking up the post of U.S. ambassador to Israel, David Friedman, a practicing orthodox Jew, made his first stop upon arriving in the country at the Western Wall, which is where he happened to bump into none other than Aerosmith lead singer, Steven Tyler—also a true story. The end result of the diplomatic verbal gymnastics was the Trump visit to the Western Wall without the Israeli head of state present. Nevertheless, if one is supposed to read something into the fact that Trump flew directly to Israel from Saudi Arabia, then the fact that the U.S. ambassador to Israel drove directly to the Western Wall from the airport also sent an important message. The question remains, what is President Trump's policy on the matter? What Awkwardness, at This Hour, Slouches toward Bethlehem? 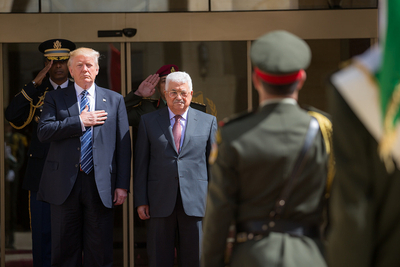 Palestinians were uniformly underwhelmed by the single hour out of some twenty-eight hours that Trump spent among Palestinians. Some joked that the main achievement of the visit was that the municipality had cleaned the streets beforehand. The Arabic-language hashtag #45minutes was also trending in social-media posts about the visit. Trump met the Palestinian leader in Bethlehem, where he delivered remarks that began by addressing the terrorist attack hours earlier in Manchester, England. With characteristically passionate anger he called the terrorists "losers" four times in less than half-a-minute. It had to be awkward for Mahmoud Abbas, standing next to him. In essence, President Trump was also calling Palestinian terrorists losers. The fact that streets and squares throughout the Palestinian Authority are named after terrorists might as well have been painted on the podium. 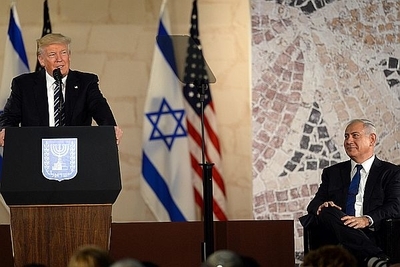 Since it wasn't, Netanyahu was sure to remind all as he spoke briefly before Trump an hour later at the Israel Museum. "Standing next to you, President Abbas condemned the horrific attack in Manchester. Well, I hope this heralds a real change," Netanyahu said. "Because, if the attacker had been Palestinian, and the victims had been Israeli children, the suicide bomber's family would have received a stipend from the Palestinian Authority. That's Palestinian law. That law must be changed." It was a drop-the-mic moment for Netanyahu, as the issue of Palestinian payments to terrorists' families happened to be the main concession from the Palestinian Authority he was publicly seeking before Trump's visit. The unfortunate terrorist attack in Manchester provided an exclamation point. In the Israeli version of "Trump Says the Darndest Things," was the priceless episode with the reaction of Israel's ambassador to the United States, Ron Dermer, when President Trump told those assembled, "We just got back from the Middle East—back from Saudi Arabia and we were treated incredibly well." Dermer pulled his head back, ran his hands through his hair and the expression of "Did he just say that? Does he know where he is?" is clearly written on his face. Certainly not the best poker face, but it was very brief and he regained his composure quickly. Overall, most of what President Trump said publicly came as music to Israeli ears after eight-years of the Obama presidency. And Netanyahu can rejoice that a rogue committee in his own government didn't take the opportunity to announce plans for settlement construction as happened when Vice President Biden came to Israel in 2010. American presidents appear addicted to solving the Palestinian-Israeli conflict even though its centrality in Arab politics has been receding for decades and its solution rates fairly low on the list of America's Middle East priorities. The fact that the pathway to peace is strewn with so much wreckage should also dissuade most from high-stakes peace poker. The quest for the modern-day Holy Grail appears to be far more about presidential legacy making. When Egypt wanted peace, their president, Anwar Sadat, kicked out the Soviet advisers, flew to Jerusalem and made peace with Israel. When the late Syrian president Hafez al-Assad decided he wanted a process of peace but not the peace itself, he had a decade-long process during the 1990s and sealed no peace. When Palestinian leaders emerge who want peace and recognize Israel's existence as a Jewish State, they'll make peace. Everything else is a photo op and contest to win the game of narratives. Israel fared pretty well in this round.